One fun thing about Tableau Public is when you see a great viz, but have another question that wasn't answered, you can take things into your hands. After downloading the visualization, you can play with the data, add data, or just take a different angle than the author thought of. 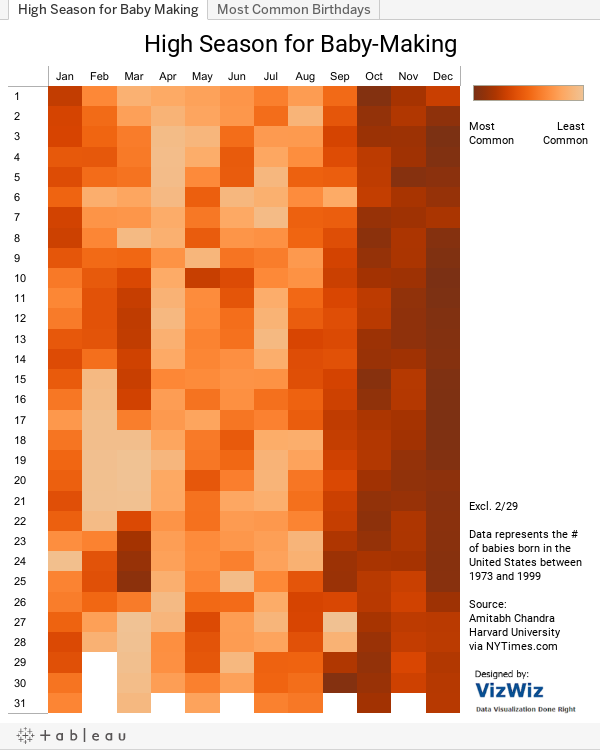 I loved Andy Kriebel's viz on the most common birthdays in the US. But while in a training session the other day, people started pointing out--if certain birthdays are so common, doesn't it mean that previous dates 9 months prior, are also common for other fun activities? If September is a popular month for having kids, maybe it's not so surprising that December is when people start seriously considering having kids. It's also a nice, cold, romantic month, I suppose. Either that or people are really planning ahead to have their kids ready for the September school season kick-off. Notice that February, or more specifically Valentine's Day, is so low--maybe kids just aren't a priority then.